The stoic facade of the Granger building at 1728 14th Street will be getting an overhaul, now that developer Perseus Realty has closed on the purchase. 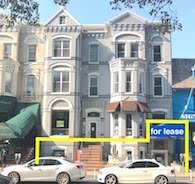 The developer sealed the acquisition of the property - located between R and S Streets - in mid-August, John Clarkson of Perseus told DCMud on Thursday; the DC Property Sales Database shows the building sold for $4.8 million. Perseus and Ogden CAP Properties are partners in the joint venture. 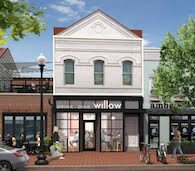 Also on board is Bonstra Haresign Architects, and Andrew Poncher of Streetsense for retail leasing. 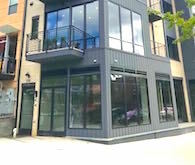 The firm is behind a number of other 14th street projects including the AME Zion church renovation and lower-level addition, the Q14 Condominiums building, as well as Studio Theater and The Aston at 14th and R, all within a few blocks down the street. Plans for the site include the adaptive re-use of the warehouse building, built in 1988, and the new design includes four floors with 28,000 square feet of retail and office space. Of the many developments slated for 14th Street, this is one of the few office concepts (Furioso's project being the other). Clarkson, who provided an up-to-date rendering to DCMud on Thursday, said Perseus expects to begin construction on the project in February 2013 with a 12-month construction time. 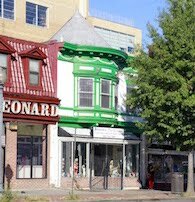 The Advisory Neighborhood Commission (ANC) 2F wrote a letter in full support of the project, which also received preliminary approval from the DC Historic Preservation Review Board (HPRB) in July. Like 1728, most of Bonstra Haresign's other 14th Street projects have also been located in the historic district, Bonstra Haresign managing partner Bill Bonstra told DCMud. "What is really important is understanding the context and what I call the DNA of the site." The site, 60 feet in width, likely once housed three townhouses, Bonstra said. "That understanding allowed us to come to terms with the appropriateness of the architecture." 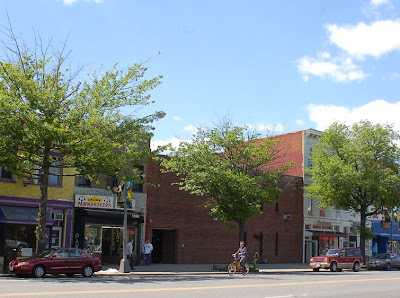 The project also sits in the context of a rich history of commercial buildings on 14th Street, many of them built in the Nineteen-teens and Twenties as automotive showrooms. 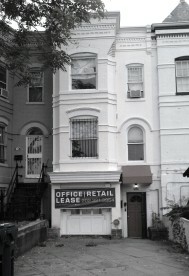 Back then, 14th Street was a trolley corridor and a place to window shop. "There was a tradition of retail and commercial buildings and we looked at that tradition as a model." The design pays homage to the street's architectural tradition with a formal facade with strong center and side doors and a masonry structure, yet also incorporates generous amounts of glass, color, and contemporary planes. Design for the masonry incorporates striping, detail, setbacks, and reveals. "What we set out to do was respect that tradition of commercial buildings on the street but also make it a building of its time," Bonstra said. "We believe that the front elevation of this building will be a nice complement to historic buildings, but it will be a part of our time architecturally." 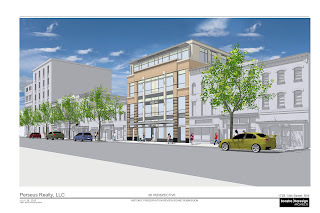 Bonstra said the building will contribute to the true mixed-use history of 14th Street, ultimately providing more of what the street lacks: neighborhood businesses and offices. The property also includes two historic townhouses north of the Granger warehouse building, but Perseus doesn't have plans to alter them at this time, Clarkson said, though those townhouses might get some interior improvements in the coming year. I'm sorry, but there has to be "adaptive reuse" of an ugly brick warehouse that was built in 1988? That is totally nuts. 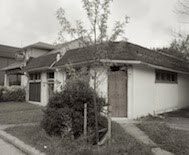 Guest: Did this article say that there "has" to be adaptive reuse of the building's bones? No. Not sure where you're reading that. It sounds like the builder is being smart and recycling what can be reused, while adding to it. That's greener construction, as well as less expensive for them. Awsome design! 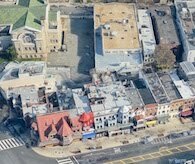 It'll build on the existing character of 14th street while removing one of the more depressing buildings from the Starsky and Hutch era of urban archtiecture. Nice job. The fact that HPRB has its nose in this is pretty strong evidence that razing the existing building isn't an option. What developer in his right mind would want to work around that ugly mess? Guest: It's in a historic district. Whether you like it or not is your opinion, of course, but the purchaser knew that going in. Unless you're the purchaser and you didn't realize that. Perhaps that's your complaint? Preservation is not always a more cost effective solution. In fact, the inefficiency of older buildings often results in higher cost than new construction. This is especially true when you are changing the original use of a building. That being said, this project is probably an example of where re-use is less expensive. Yes, SW CEO, reusing can sometimes result in higher costs, but its still a greener solution because it uses less raw materials, less transportation, etc. That's why they say the greenest home is one that's already built. My complaint is that you think your opinion is the only one that matters. Maybe somebody with some actual knowledge could explain how in any universe an ugly brick warehouse that was built in 1988 can be considered historic. Guest: I never said my opinion is all that matters. Methinks you're being a little touchy here. Good luck. Someone thinks this design is "awesome"? Granted, it's better than the jail-like building that's there now, but it's really unexciting. Symmetrical, unadventurous, blah. Snooze. . . I'm in agreement with the last anonymous about the design. The facade design, based on the rendering provided, looks amateurish. Badly proportioned, overwrought yet bland, 80's postmodern rehash--the kinds of design problems that HPO's Steve Callcott is usually quite good about gently nudging applicants to improve. This is especially true given Bonstra-Haresign's 14th Street portfolio. Q14 is okay, but not more than okay. I'm especially offended by the pair of glass doors on the 14th Street sidewalk which have a 24/7/365 fluorescently-lit egress stair beyond. The Aston Condominium is looking like a cheap, worse-proportioned version of Q14. And this design looks like an even cheaper, even worse-proportioned version of the Aston. At least it's mid-block. 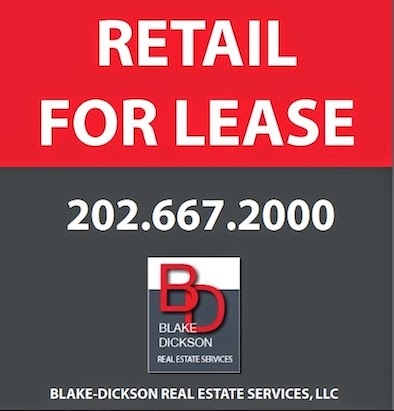 Full of retail and other vital commercial tenants, will it be a good addition to the block? 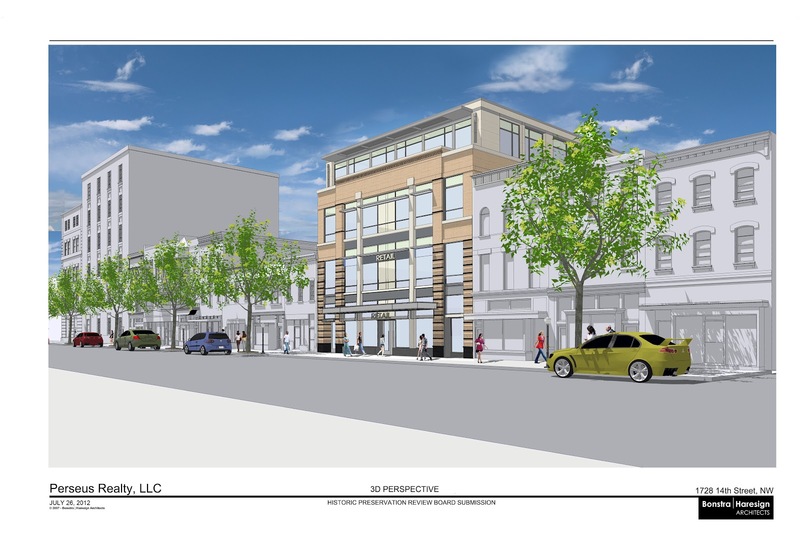 Sure, but then so is the architecturally dreadful Rite Aid commercial row at 13th & U. And of course this design is an improvement on the prison facade currently there--what wouldn't be?! Is it too much to expect more? Does anyone think they are going to save anything beyond a few I beams from the existing building? It's essentially an empty box or was when Kozmo.com used to rent it. Isn't "adaptive reuse" just a term or art to avoid some level of bureaucratic hoop jumping? The building is not historic, so calling it an adaptive reuse has no impact on any bureaucratic approval. It seems they are reusing the building to cut costs. Not sure why the term is creating stress for anyone. Thank you to the most recent 'anonymous'! Many of the previous commenters seem to think that somehow the architects and developers are pulling a trick on us, something like when NYC developers keep foundations of townhouses and build 10-story slivers. No such thing is going on here. I think it's just sloppy semantics. The only potential reason I can think of would apply only if the building were pre-1958. If so, and if any of the tenants are "preferred users," the ARTS overlay (zoning, very complicated) allows a greater multiplier for "bonus density." But this building dates from the 1970's. And at only 4 stories, I don't see a density-grab here. I think the facade is disappointing, but it isn't a greedy project.